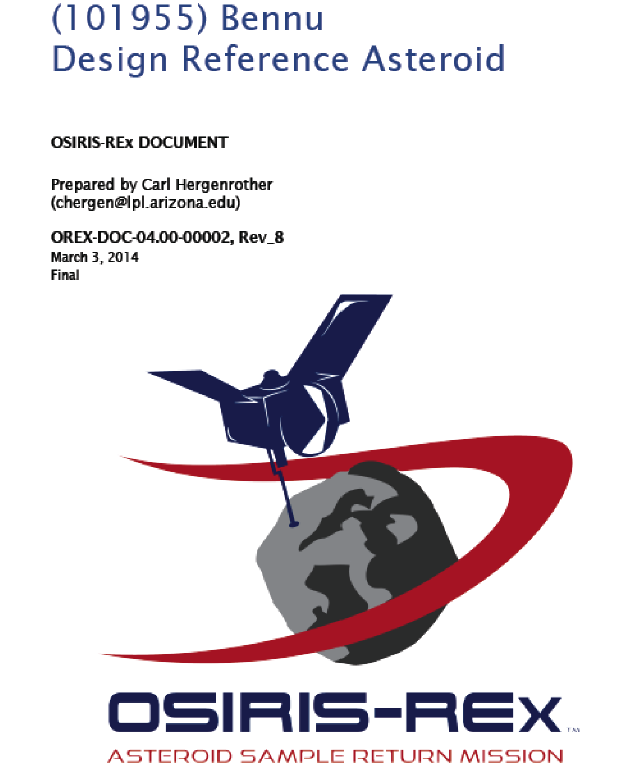 Today, we released the OSIRIS-REx Design Reference Asteroid (DRA) document to the public. The DRA is a compilation of all that is known about the OSIRIS-REx mission target, asteroid (101955) Bennu. We are making this document available as a service to future mission planners in the hope that it will inform their efforts. The Cover Page of the OSIRIS-REx DRA. This document is a central reference for many members of the team. The DRA contains our best knowledge of the properties of Bennu and has been used to inform mission plan development and flight system design. This product is similar in nature to our Design Reference Mission (DRM). As I have said before, the DRM is basically the battle plan for OSIRIS-REx for accomplishing our goal of returning pristine samples from asteroid Bennu. For this exercise, the DRA contains all the properties of Bennu that are assumed in the DRM. The extensive observations of Bennu between 1999 and 2012 have made it one of the best-characterized near-Earth asteroids. Bennu (provisional designation 1999 RQ36) was discovered on September 11, 1999 by the Lincoln Near-Earth Asteroid Research (LINEAR) survey (Williams 1999). Bennu has a synodic period that results in a close approach to the Earth every six years, providing regular observing opportunities. It was characterized during three apparitions in 1999-2000, 2005-2006 and 2011-2012 when it peaked in brightness at V = 14.4, 16.1 and 19.9, respectively. During these apparitions members of the OSIRIS-REx team and their colleagues conducted an extensive astronomical campaign, measuring a wide range of chemical, physical, and dynamical properties. Observations were also made with the Spitzer Space Telescope in 2007 and 2012 and with the Hubble Space Telescope Wide-Field Camera 3 in 2012. These graphs show the brightness of Bennu in the sky from 1999 – 2013. Remember that lower magnitudes mean brighter objects. Bennu has two peaks at each apparition, one during Earth close approach and one when the asteroid is in opposition (like a full Moon). The DRA contains our best estimates for many physical parameters that span a number of categories including: Orbital, Bulk, Rotational, Radar, Photometric, Spectroscopic, Thermal, Surface Analog, and Environment Properties. Some results described in the DRA have been published in peer-reviewed journals (see reference list below) while OSIRIS-REx Science Team members and/or external reviewers have reviewed others internally. Some data, such as Surface Analog Properties, are based on our best knowledge of asteroid surfaces, in particular those of asteroids Eros and Itokawa. The knowledge of Bennu has had a major impact on the design of OSIRIS-REx. This exercise demonstrates that asteroid astronomy is an essential tool for informing asteroid-mission design and providing context for returned asteroid samples. For example, the extensive knowledge that exists as a result of our telescopic characterization of Bennu was critical in the selection of this object as the mission target. 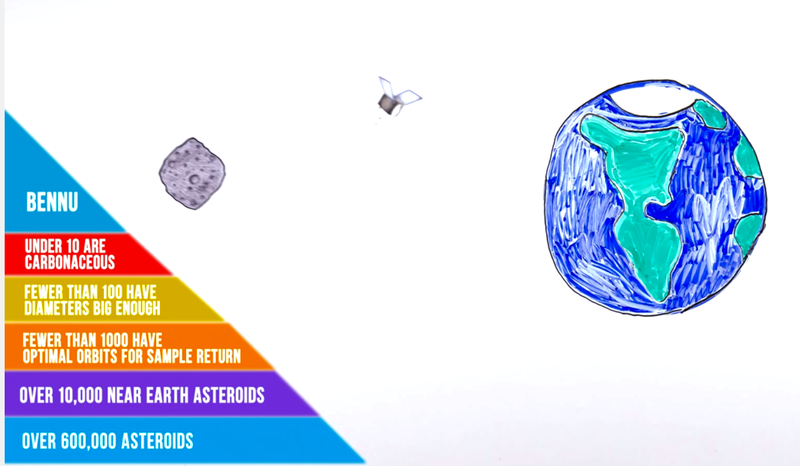 Check out our 321-Science video to learn how we chose this asteroid as the target of OSIRIS-REx. Some of the most important parameters for mission design are the orbit, mass, shape, and rotation state. 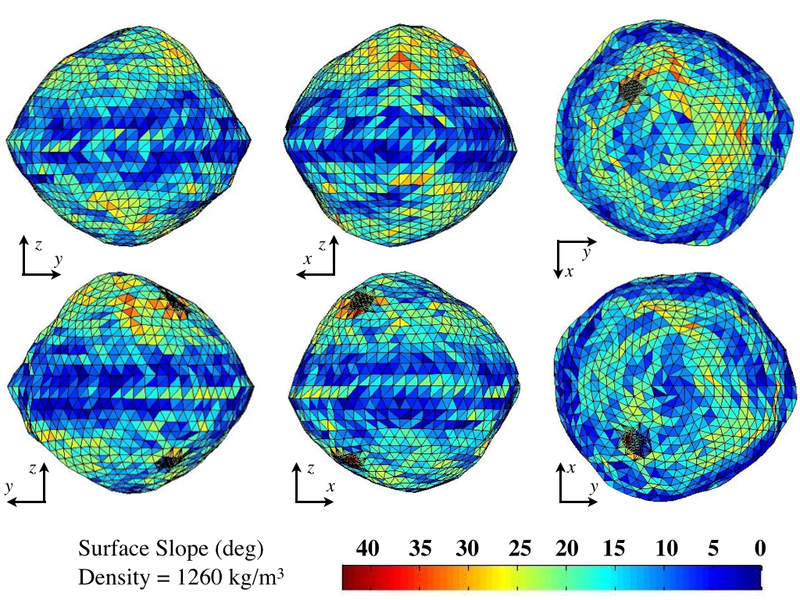 Combining the derived density with the shape model provides a global asteroid gravity-field model, which allows the team to evaluate the stability of various orbits about the asteroid. The gravity-field model and the rotation state allow us to develop a global surface-slope-distribution model and a global surface-acceleration map (below). These models are critical to evaluating our ability to safely deliver the spacecraft to the asteroid surface and maintain a nominal attitude during a five-second touch-and-go sampling event. Finally, combining the asteroid shape, rotation state, ephemeris, and albedo yields a global temperature model, which is critical for ensuring that the spacecraft will not overheat during close approaches to Bennu’s surface. All of this information feeds directly into the design of the OSIRIS-REx flight and ground systems, reducing risk and increasing the chances for mission success. These figures show the slope distribution on the surface of Bennu. This information provides confidence that loose regolith can accumulate at the equator. One of the key science objectives of OSIRIS-REx is to Improve asteroid astronomy by characterizing the astronomical properties of a primitive carbonaceous asteroid to allow for direct comparison with ground-based telescopic data of the entire asteroid population. The DRA plays an important role in achieving this objective. Since I am a Professor, my inclination is to grade people’s work. I will grade the efforts of the OSIRIS-REx astronomy group by comparing the values in the DRA with post-encounter science results using data obtained at Bennu during the encounter in 2018 and 2019. This exercise will allow us to determine the accuracy of our Earth-based characterization efforts. In cases where our telescopic observations provided accurate information, we will be able to continue to confidently apply these techniques to other asteroids. However, the most interesting results will be obtained in areas where the ground-based observations failed. In these instances, we will be able to use the additional encounter observations to thoroughly review and refine our techniques. The resulting knowledge will improve our ability to characterize small bodies throughout the Solar System. You can download the OSIRIS-REx DRA here: http://arxiv.org/abs/1409.4704 . Chesley, S. R., Farnocchia, D., Nolan, M. C., Vokrouhlicky, D., Chodas, P. W., Milani, A., Spoto F., Rozitis B., Benner, L. A. M., Bottke, W. F., Busch, M. W., Emery, J. P., Howell, E. S., Lauretta, D. S., Margot, J.-L., Taylor, P. A. (2014). Orbit and bulk density of the OSIRIS-REx target asteroid (101955) Bennu. Icarus 235, 5-22. Emery, J. P., Fernández, Y. R., Kelley, M. S. P., Warden, K. T., Hergenrother, C., Lauretta, D. S., Drake, M. J., Campins, H., Ziffer, J. (2014). Thermal Infrared Observations and Thermophysical Characterization of OSIRIS-REx Target Asteroid (101955) Bennu. Icarus 234, 17-35. Lauretta, D. S., A. E. Bartels, M. A. Barucci, E. B. Bierhaus, R. P. Binzel, W. F. Bottke, H. Campins, S. R. Chesley, B. C. Clark, B. E. Clark, E. A. Cloutis, H. C. Connolly, M. K. Crombie, M. Delbó, J. P. Dworkin, J. P. Emery, D. P. Glavin, V. E. Hamilton, C. W. Hergenrother, C. L. Johnson, L. P. Keller, P. Michel, M. C. Nolan, S. A. Sandford, D. J. Scheeres, A. A. Simon, B. M. Sutter, D. Vokrouhlický, K. J. Walsh. The OSIRIS-REx Target Asteroid 101955 Bennu: Constraints on its Physical, Geological, and Dynamical Nature from Astronomical Observations. Meteoritics and Planetary Science (in press). C. W. Hergenrother, M. C. Nolan, R. P. Binzel, E. A. Cloutis, M. A. Barucci, P. Michel, D. J. Scheeres, C. Drouet d’Aubigny, D. Lazzaroh, N. Pinilla-Alonsoi, H. Campins, J. Licandro, B. E. Clark, B. Rizk, E. C. Beshore, and D. S. Lauretta. Lightcurve, Color and Phase Function Photometry of the OSIRIS-REx Target Asteroid (101955) Bennu. Icarus 226, 663–670. M. C. Nolan, C. Magri, E. S. Howell, L. A. M. Benner, J. D. Giorgini, C. W. Hergenrother, R. S. Hudson, D. S. Lauretta, J.-L. Margot, S. J. Ostro, D. J. Scheeres. Shape Model and Surface Properties of the OSIRIS-REx Target Asteroid (101955) Bennu from Radar and Lightcurve observations. Icarus 226, 629–640. K. J. Walsh, M. Delbó, W. F. Bottke, D. Vokrouhlický, D. S. Lauretta. Introducing the Eulalia and new Polana asteroid families: re-assessing primitive asteroid families in the inner Main Belt. Icarus 225, 283-297. B. E. Clark, R. P. Binzel, E. Howell, E. A. Cloutis, M. Ockert-Bella, P. Christensen, A. Barucci, F. DeMeo, D. S. Lauretta, H. Connolly Jr., A. Soderberg. Asteroid (101955) 1999 RQ36: Spectroscopy from 0.4 to 2.5μm and Meteorite Analogs. Icarus 216, 462-475. M. Delbo and P. Michel. Temperature History and Dynamical Evolution of (101955) 1999 RQ 36: A Potential Target for Sample Return From a Primitive Asteroid. The Astrophysical Journal Letters 728, L42 (5pp). H. Campins, A. Morbidelli, K. Tsiganis, J. de Le´on, J. Licandro, and D. Lauretta. The Origin of Asteroid 101955 (1999 RQ36). The Astrophysical Journal Letters, 721, L53–L57. A. Milani, S. R. Chesley, M. E. Sansaturio, F. Bernardi, G. B. Valsecchi, and O. Arratia. Long term impact risk for (101955) 1999 RQ36. Icarus 203, 460–471.